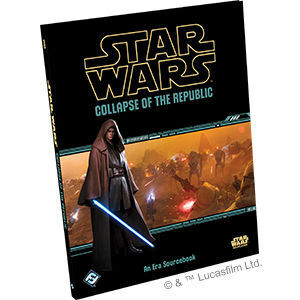 Discover the last days of the Old Republic with Collapse of the Republic, a new sourcebook for Star Wars™ Roleplaying! This sourcebook explores the latter days of the Clone Wars and is fully compatible with the complete Star Wars Roleplaying game lines including Edge of the Empire, Age of Rebellion and Force and Destiny. Look for new Player Charater options including the ability to play as a Death Watch Warrior, a Nightsister, and more! The Game Master also gets plenty of new tools including profiles on iconic NPCs, Gazeteers for famous planets during this era, and continuing campaigns through the events of Order 66 and the end of the Clone Wars.